Yes peeps! 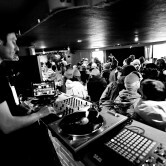 Rinsing the best in party hip hop, house, breaks and beyond at Mint Bar Wanaka, NZ! Hip Hop warm up @ Tardis! Yes peeps warming up at Tardis Bar, Queenstown next Friday! Hip Hop and beyond…..